The workers at A.B.Urfabriken over the years have proved themselves to be very creative and often produced for their own purposes, items that we not on the standard production line. They were encouraged by management, to be experimental, creative and think outside the box. Primarily this encompassed, reel designs or reel modifications and lures styles of colours, weights etc that were not standard production. Some of these made it into being full product lines. Others withered on the vine, so to speak, still others were made as an indulgence purely for personal use or interest. These were many in number and wide in nature over a long period of time. The strangest I have ever come across is a beautiful black patent crocodile skin (or fake) ladies evening bag emblazoned with the ABU 20/30 metal label, no doubt for a worker's wife or lady friend. A token of respect for which the name Ambassadeur stood I think. Images supplied by fellow Aussie Rod Cameron, noted collector and touched with the same ABU passion as myself. "Wayne, I have never seen or heard about this! Len"
This topic of customizing has always fascinated me as it is always been human nature for some to try to strive for improvement over the last known mark, be it in production or performance ...even when the the present results are good. Companies can do this and individuals also...and for vastly differing reasons! This is not the traditional business model where one keeps lifting performance targets to attain the level where the key resources fail and then come back a notch! Rather it is one of doing it for pride sake, making a better pin so to speak. There are a number of organizations/individuals outside the PF organization that create super tuned reels. Individuals and small companies have the luxury of sseing a market niche, hand creating some components, assembling and charging significantly for the very small number of people willing and able to pay for a high priced product. Pure Fishing ABU-Garcia too, each year do special issue production runs for collectors. They also offer Factory -tuned reels with go -fast parts on board for the enthusiast. They also do very limited runs, such as 67 only Morrum Ambassadeur, wooden box issue of Left and Right hand reels. Watch out for the frauds who try to pass off on E-Bay, reels that seem to be unique or one-off and attempt to sell the same for a handsome profit as an original ABU creation ! Gold 5500 Ambassadeurs have been target of this technique in recent years. Ask for advice from knowledgeable friends before bidding or investing, especially if unsure of the seller! I have been tricked too! This is different if the modification is acknowledged and the seller is testing the water for a buyer for his creative endeavours. See a magnificent but FAKE Ambassadeur 5000 C Deluxe here. Spot the differences! Links below or on this page look at non-Pure Fishing but still legitimate modified ABU reels. Simon Shimomura (botton of page) is annointed to use, modify and creat beautiful , asthetically pleasing Ambassadeur reels for the PF organization, which by and large caters to mass market. I am proud owner of one of the most exquisitly manufactured Ambassadeurs viz 6500 C in gunmetal and gold livery. Dave Brown made my first magged modified casting reel. Jerry from Hookless Custom Ambassadeur reels USA made my next set of modified reels. I have recently discovered other not approved of, but never the less, options more for high-end fishing enthusiasts, rather than merely Collectors. These are just too good to sit on a shelf. Both my 2500/6500 UT Custom Reels made my Ulf Tingstrom have been previously featured. A new company (to me at least) is PMR which stands for Pimp My Reel, is selling made to order Ambassadeurs which glisten with go-fast options, finishes that are unique, eg Tuff Stuff coatings etc. I am ordering one of these myself. Do I really need another reel my wife asks? In this case as an actual reel to fish, if feel I have to put it through it paces and will review here at a later date. Enjoy Jamie's PMR Utube channel and be stunned! Akios reels by Steve Bradbury must be added soon when contact is made. Kalama reels makes some very beautiful uniquely coloured Ambassadeurs. My own original set of 6600C , 5600C, 4600C Ambassadeurs can be seen here with my 'spare' set of Custom refinished Champagne Gold models. My friend Joel from USA loves the 4500 size reel and has created a number of his own personal Ambassadeurs for his own pleasure. 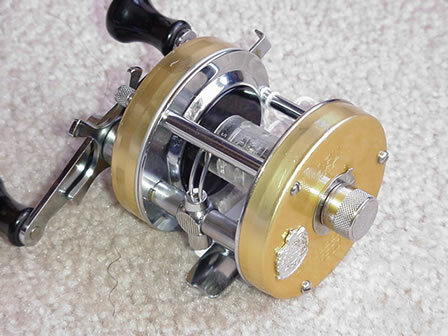 Jerry from Hookless Custom Ambassadeur Reel Building USA also creates awesome modfied Ambassadeur reels, likewise Jay Parker from Australia and I'm sure no doubt thousands of other who tinker. Jerry has made me a set of three Camo Ambassadeurs. The two factory originals are 6500 C and 5500 C whilst the 4500 C is "created" from with standard camo reel end plates mounted on a 4500 C size frame. neat and not for all but the ways a fan can personalize are endless and really limited only by ones imagination. Nice one, or should I say 3, Jerry! I own a rare modified ABU 2300 Tournament reel which would be useless for fishing but superb for casting long distance to attain world records and even better to collect and marvel at the efforts of the time to excel. Sadly it is missing the custom spool which would only be 6mm wide! One day it will be complete I hope. On an organizational level, ABU has been involved in this process since the beginning, it really was part of their Research and Development program. Contented staff were happy to test the products on the beautiful Morrum River. Things tested here ranged from rods, reels and lures. Some lucky collectors have been able to collect such prototypes which never reached the mass production stage. Hey I'd like to be a chocolate tester at Cadbury's too! We saw national pride in International Casting competition, sated by the in-house specialized production of the combo casting rod and reel , tea combination of technology and human skills which would eclipse all other nations. This was made in limited numbers and given or sold (I do not know which) to deserving and upcoming Swedish Tournament Casters. More recently they have released some special events reels. Dave Brown of the UK is paramount among these talented engineers. I hope to talk more with Pete Coogan, in future on his significant role in the continuing development of ABU reels. More details on Dave's special skills are linked here. Here are a few pictures of your reel starting with a couple showing complete strip down of all parts ,then one of the cage minus levelwind ,next shows the aluminium spacer bar and screws and special washer prior to fitment,then the bar fitted plus redundant holes filled with plastic gromits finally the completed reel with mag system fitted and the pile of bits we didn't need any more . Thats about it really,the reel will be safest with a light oil in the spool bearings and maximum mag braking after the cast is released you can start to release the mag braking by winding it off midcast, a mistimed release ends in a massive over run its all about getting used to the reel and its characteristics, casting without any braking also has a similar effect. The beauty of it is the way it can be set exactly for each person ,the ABU sliding system used in the Mag Elites is badly flawed in that each division on the slider doesn't correspond with the movement of the magnets so from position 2 to 5 the magnets may only move 0.15 mm yet from 7-8 they may move 0.5mm reprofileing the cam inside is possible and worth doing .. I have built a few small (3600) sized Black Max reels purely for long range bait fishing here a good range of adjustment is vital when casting a range of light lures into different wind conditions. Dave Brown's special piece on the history of UK ABU CT type beach casting reels is here. Tournament Casting efforts, where today casts of more than 200m are commonplace, sees most work in this area taken over by the mag reels from the 80's. Specialized changes, (above) see these reel re-built to be strong enough to withstand the huge pressures placed upon them when asked to cast 8oz leads with heavy shock leaders in beach casting, whether it be to get the bait out over the surf breakers, or to win a competition of distance alone. Moving on in time, we see other nations come into this market. Notably Japan, not only were special reels made for this most affluent of markets peaking in the 90's , but we saw the development of other Tuning Companies which took an otherwise superb product like the Morrum series of reels and fine tuned it to even great refinement. I hope more detail will come to light here and maybe some Japanese fans will supply images and details. Pure fishing have just released the 911 Series commemorating the bravery of Police and Fireman who gave their lives helping others! I know of Simon Shimomura's operation which is officially sanctioned and licenced by Pure Fishing to produce/reproduce their superb range of faithfully authentic and re-engineered Classic Ambassadeurs , spare parts for these classic as well as the fabulous books of course. I also know of other lesser operations where it is almost certain that the new product created is understandably NOT warranted by Pure Fishing. The good ones back there work! Be careful of your purchases, even if the reel is very expensive and seeming new and better than ABU made them! I have heard horror stories of incorrect fitting /removal of bearings, almost correct alignments, but generally not the real deal, most certainly without the 10 year warranty that ABU once placed upon its reels. I have recently had created my own personal custom painted set of ABU plastic plugs of all types except the Rakan , viz Killer ,Hilo, Snoky, Cello , Kynoch. These beautiful hand sprayed creations are to be seen here and were created by my friend Darcy Menchin who himself is one of Australia's premier wooden lure designer and creators. His creations are varied and works of art which both catch fish and deserve to be preserved in collections. His works fetch from $15 to $100 per items depending on size/colour and time to carve/finish. Details of his small personal workshop/business are linked here. (A spare Rakan is still missing , very much needed, and I would love to find one to paint up for my custom display). Anyone who wishes to add more detail here please feel free to place your helpful news which will be acknowledged here.